In recognition of Fair Trade Month, Marigold Fair Trade Clothing has a new blog series entitled: “Fair Trade From the Seed to the Consumer.” Our beautiful, fashion-forward products represent a completely fair trade supply chain, and you can be assured that from the cotton seed to the finished product, your Marigold purchase is helping to transform the lives of workers and t heir communities. Holding true to our value of transparency, and in an effort to educate and advocate for the Fair Trade model, we are opening up, and explaining, our complete value chain to the consumer public. In Part 4 (and the final installment of this series), we will explore the fourth major link in the supply chain, and the one that you are probably most familiar with: Distribution & The Consumer. In addition to selling directly to our consumers at events around the Seattle, Washington, area, and through our online catalog and shopping cart, we have the privilege of working with an amazing set of 60+ retailers across the country. Marigold is based on a wholesaler model, and so we really rely on our retail partners to spread the word about fair trade and distribute our products to the end consumer. We love working in close collaboration with stores to develop new products that suit the needs of their customers, and it is our goal to make the decision to buy fair trade an easy one! In order to reach the biggest audience we can, staff at Marigold frequently speak at colleges, schools, community groups, festivals and events to share our story and spread the word about fair trade. We are also often involved in ethical fashion shows and stay involved in the local and global fair trade community through our social media sites. By staying connected to the movement, we can speak directly to retailers who may be entertaining the idea of offering ethical fashion and housewares, but we can also engage in a direct dialogue with you, our consumer. Our distributors are essential to our success, but we also love to hear directly from our consumers. You can tell us what’s hot, what’s not, and offer general feedback on our products and what you would like to see Marigold offer next. At the core of Marigold’s values is the idea of transparency, which is exactly what inspired us to open up our supply chain to the public with this blog series. We consider ourselves to not only be a fair trade clothing designer and wholesaler, but also an organization that spurs discussion, innovation and change. We want our retailers and consumers to feel engaged with Marigold, and know that you are playing a large part in furthering the fair trade movement. The conventional garment industry, and what we have come to accept as normal and the law of the land, is one of secrecy and an impossibly long and convoluted supply chain that makes it difficult for consumers to know the story of the product. Marigold’s business model turns this antiquated system on its head by giving the consumer complete insight into the production process. We have no secrets, and because of this, when you purchase a Marigold product, you can be sure that you are getting the complete, honest, and fair history of the item. Entry filed under: Supply chain, Uncategorized. 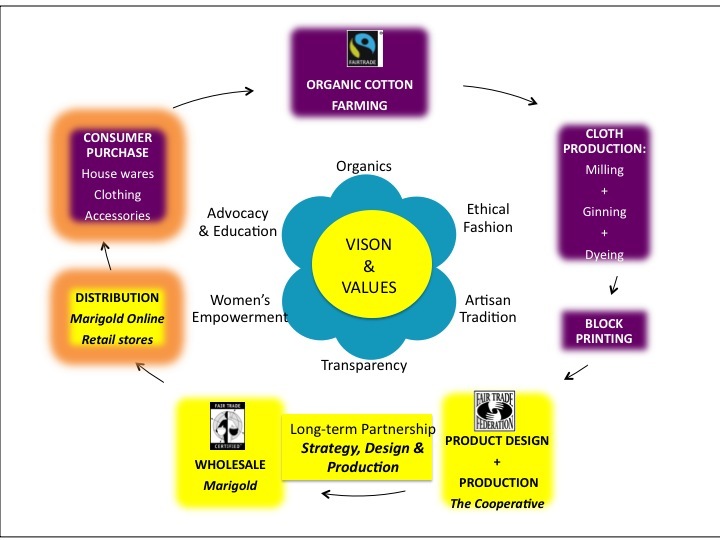 Tags: consumer, distribution, fair trade, Marigold, organic, purchase, supply chain, transparency, wholesale. Exclusive Fair Trade Month Offer: 15% Off Coupon for New Customers	Our last FREE FAIR TRADE FRIDAY Giveaway: Win 2 fantastic prizes!